In order to understand certain concepts in science, engineering, and research, we may need to understand how waveform phase and phase cancellation can effect the interactions between waveforms. Without a fundamental understanding of this subject, it may become difficult to identify and pinpoint phase problems, especially when we’re dealing with audio and music production. Sine waves are periodic mathematical functions represented by the equation y(t) = A sin(ωt + θ). It may look confusing to those of us who have never been exposed to it, but this equation basically says that the y-value (height) in a time-versus-height graph depends on the independent variables of amplitude, frequency, time, and phase. Phase is a translation or shift of the waveform along the x-axis (time). We measure phase in degrees or radians, from 0° to 360° or 0 radians to 2π radians. 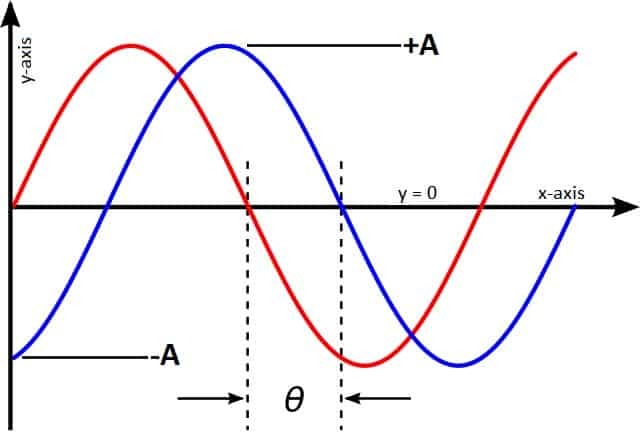 If the sine wave amplitude starts at a height of 0 like the red one below, we can say it has a phase of 0°. As phase increases, the sine wave shifts forward in time along the x-axis in such a way that it will no longer start at a height of 0. 90° of phase represents a one-quarter cycle shift and the wave starts at -A. 180° represents a half cycle shift, which starts it at 0 and inverts the sine wave. 270° represents a three-quarter cycle shift and the wave starts at +A. 360° represents a full cycle of shift, which is equal in effect to 0° and starts the wave again at 0 height/amplitude. Keep in mind that phase is not restricted to increments of 90°. Phase is relative, meaning we can only define it by comparing it to the phase of another sine wave, or the same sine wave at a different point in time. The above illustration shows two sine waves that are 90° out of phase (θ = 90). We can think about waveform phase like we do the phases of the Moon. Waveform phase is just a number indicating where the sine wave is in its cycle. The phases of the Moon are just names indicating where the Moon is in the lunar cycle. So with that in mind, one full rotation of the Moon is like one full waveform cycle. We can see why it makes sense to use degrees to measure phase. 360° represents one full rotation of an object and 360° of phase is one full sine wave cycle shift. Two waves are said to be “in phase” when their phase shifts are equal. When their frequencies and phases are equal and we add them together, their peaks will align and stack up on top of each other. This will create a new wave with an amplitude that’s greater than the amplitude of one of the component waves. We call this constructive interference. Phase cancellation or destructive interference occurs when two waves with the same frequency and a 180° phase difference are added together. The peak of one wave lines up and combines with the trough of the other, and the waves cancel each other out. This results in a flat line with 0 amplitude and effectively eliminates both waves. Does your mix ever sound like something is missing? Do sounds you know are there seem to just vanish in the presence of similar sounds? If you’re dealing with lower frequencies, you may be experiencing a real-life example of phase cancellation. We need to keep in mind the effects that phase and phase cancellation can have on our sound. This requires an awareness of the frequency, phase, and timing of the waveforms we are generating. Sometimes, performing a spectral analysis or waveform analysis may be necessary to fix phasing issues, but the best analysis can be done with your ears. Interesting implication to harmonics as well.